By the time I had heard enough about artist and filmmaker Matthew Barney to be intrigued by his work, I had missed the chance to see it (Barney is notorious for not allowing his movies to be released on DVD.) So when Drawing Restraint 9 came to theaters, I jumped at the chance. I liked the movie, although I’m not sure I explained it well in my review. What I was missing was some background on Barney and his work. I found those missing pieces in Matthew Barney: No Restraint, an essential companion piece for anyone who feels like they didn’t quite get Drawing Restraint 9. It turns out that Drawing Restraint 9 is actually a pretty straightforward movie. It needs no secret decoder. It really is about whaling, about mankind’s connection to whales, about celebrating petroleum products, about Japanese ceremonies, and about that one shape. If any of us didn’t “get” the movie, it’s only because we were looking for something that wasn’t there. The value of Matthew Barney: No Restraint, then, is not that it “explains” Drawing Restraint 9. The value is that it explains Matthew Barney. You can look at Matthew Barney: No Restraint as a documentary movie, or you can use it as the basis for a conversation about Barney himself. As a documentary, Matthew Barney: No Restraint joins other docs-on-artists like The Mystery of Picasso, My Architect, or Crumb. In that company, No Restraint seems rather traditional and plain. It has clips from Barney’s works, talking head-interviews, and some footage of the artist at work. The documentary itself doesn’t try to do anything to grab your attention; it simply tries to present the subject within the framework of a documentary movie. But when your subject is Matthew Barney, perhaps a “normal” framework is the best way to present the artist. Better to let the artist jump out of those boundaries himself, rather that approaching the documentary as a work of art. 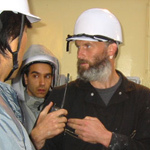 But Matthew Barney: No Restraint takes him seriously and gives a solid overview of his career to date. The movie doesn’t deliberately invite any detractors to go on camera, but neither does it force an opinion of Barney on you. If you’ve seen any of Barney’s work and wanted to know more, Matthew Barney: No Restraint is the movie for you.